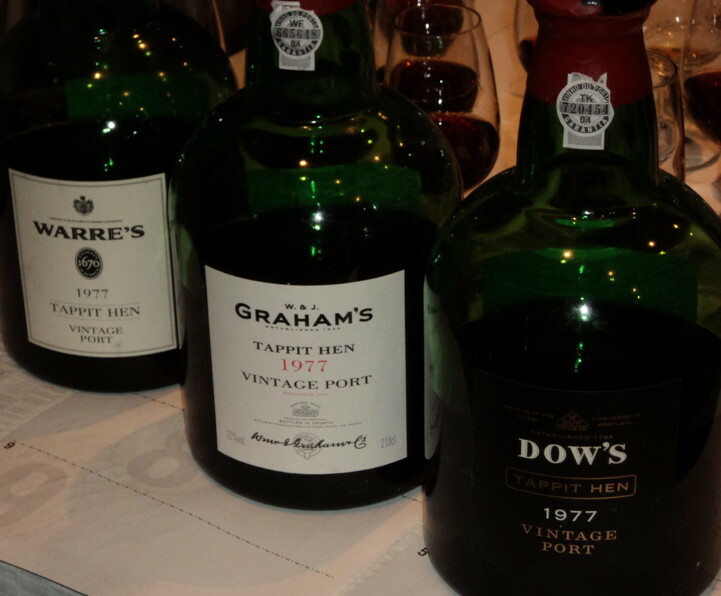 Returning from my 54th consecutive day of toil in 2013, i was delighted to discover a care package containing three samples of 77 port (Dow, Graham, Warre) had been delivered courtesy AHB. Labels indicate that these were opened on Thursday, meaning a 48-60 hour decant. 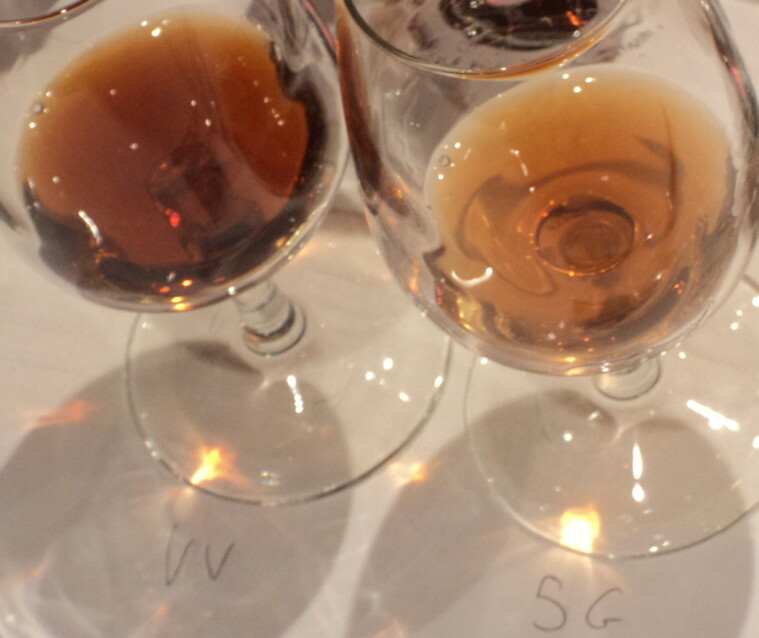 Making use of coloured headbands, these ports were decanted unsighted into three glasses for a semi-blind tasting. all quite similar in colour, none obviously corked on the nose...none particularly spiritous...so no immediate way of picking the Dow and Graham. Port 1 - Orange headband: Some age to nose, though still lovely and fresh red fruit. Initial impact on palate is sweet but - if critical - slightly hollow and flat, though flavour builds thereafter with a citric mid-palate bite leading to a long cough mixture finish full of pleasant heat. This is good port. Combination of heat and sweetness make me think Graham. Port 2 - Blue headband: smells like mature port, hint of sweet strawberry fields makes me think Warre. Really very inviting. mid-weight, with flavoursome red liquorice and cranberry dryness and at finish (actually...is this Dow?). Disappears a bit at end, though in a way that invites another sip. Glass soon emptied. Not as strong overall as Port 1, but the nose was beautiful. Warre / Dow. Port 3 - white headband: similar to Port 2....both in nose and flavour - same dryness - but this seems somewhat bigger with much more complexity and persistence at the finish, lovely peppery aftertaste that leaves a long tingling in the tongue and cheeks. Yum. WOTN. Blind i could imagine guessing this as Taylor. Conclusions: I'd be more than happy to have any of these in my cellar - particularly the Dow if it could reliably taste like this! I didn't get the feeling with any of these that they need a massive amount of extra time. That said, i'm sure they'll continue to drink well for two or three decades. Very many thanks to AHB! Stop before you damage your ’elf. Just for clarification, these were opened on Wednesday, and the "TH" on the label meant that they had been poured from a Tappit Hen into the care package bottles on Friday. By the time you got to drinking them, they had had a 72 hour decant and seem to have been showing very well indeed! Incidentally, I tried them all again this weekend and the Dow is my clear favourite - and could, perhaps, be my first non-TCA tainted Dow 1977! AHB wrote: my first non-TCA tainted Dow 1977! I remember my first non-TCA tainted Dow 1977 like it was yesterday! The fourth Dow 77, and was finally able to understand the bottle's reputation. 77 is a hugely variable as a vintage, and, aside from the Smith Woodhouse, is not something I am keen to purchase. A pity, as bottles showing well almost always show VERY well. Sounds like a good little event! The evening after the New Douro Tasting at the Portuguese Ambassador's residence in London, three Tappit Hens of vintage port were opened. This was as much an excuse to see how large format bottles affect the aging of port as it was an excuse to just drink the stuff. As as added bonus, there was also a small glass of the soon to be released 5G muito velho port and a glass of the 2012 bottling of Niepoort's Vinha Velha. Links to the tasting notes are below. These are the same bottles which RAYC posted about earlier in this thread.